Here are a couple of snapshots from the area around Jackson Hole, Wyoming. The first, taken from the banks of the Snake River, shows Mount Moran, elevation 12, 605 feet (3,842 meters). 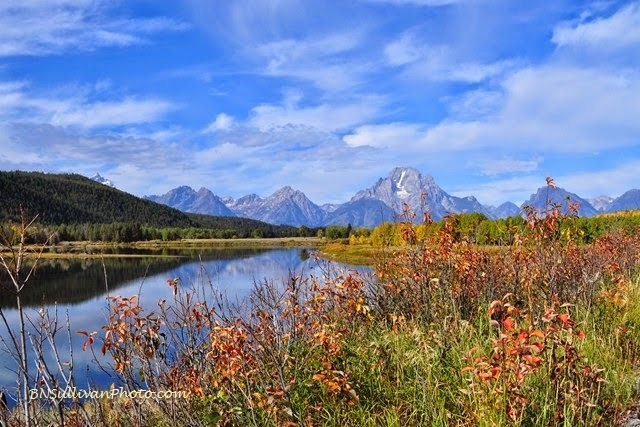 The mountain is located in Grand Teton National Park. The second photo, below, shows Jenny Lake, situated at the base of Grand Teton National Park's Cascade Canyon. There is a nice seven-mile hiking trail around the perimeter of the lake. I have always liked this part of Wyoming, but have never visited. A panoramic view of crags and water is something I love. Just noticed your comment. I definitely encourage you to visit western Wyoming: Jackson Hole, the Tetons, Yellowstone. The views are breathtaking and there's so much wildlife to see, too.